As of January 2013, due to the limited number of spaces remaining it was decided to restrict the sale of full size spaces to MEMBERS only. (2) Have proof of DIRECT LINE family member buried at BCC, with a plot in good standing. Direct Line includes grandparent, parent, child, grandchild, great-grandchild, etc. Full spaces are available to members only, please see above for more details. 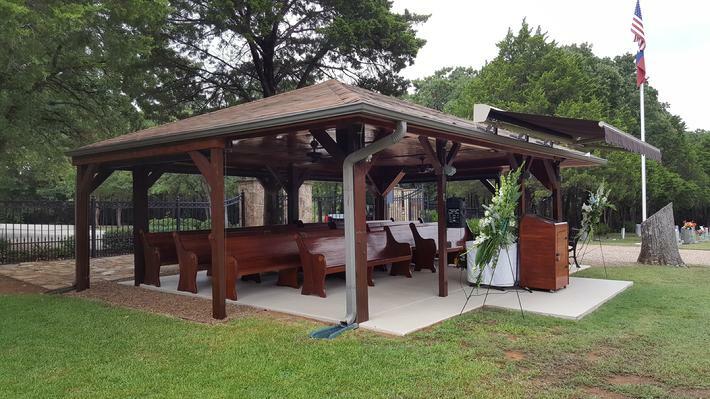 All FULL internments include the optional use of the remodeled pavilion (our semi-enclosed area with seating, utilities and a full PA system, complete with microphones and iPod/CD player capability) that may be used for your service. A half space will accommodate a young person (4x5 ft.). 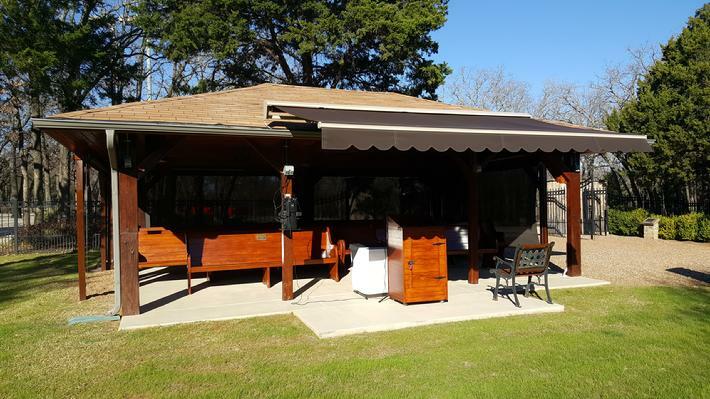 $1,000.00 Total: includes one space, cemetery fee, opening/closing and a standard marker or a $100.00 credit towards a marker of your choice (no liner required). 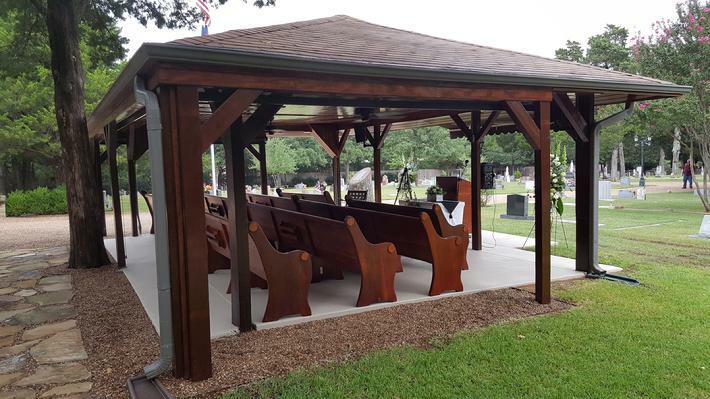 For your Cremation/Baby Land Service, our remodeled pavilion which (seats 45-50) or our new 15'x10' Garden Tent set up which (seats 10 by the graveside) is available for a fee of $100.00 each. 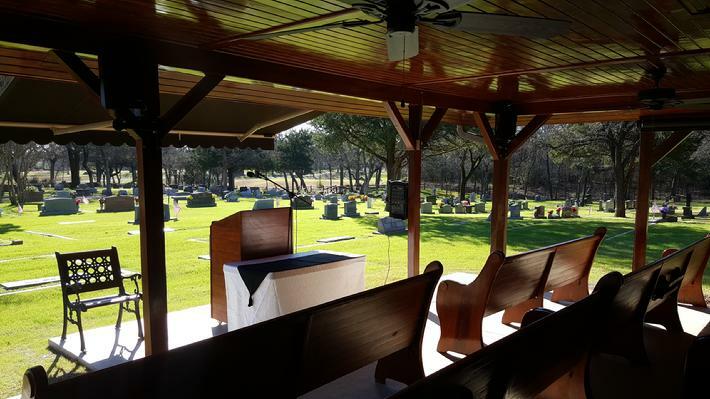 For our Cremations and Baby Land Services, an outer container is not required; however, should you wish to use one, there will be an additional $50.00 preparation charge. In order to purchase any spaces at Bear Creek Cemetery, you must agree to place a marker within six (6) months after any internment. All markers must be located on your space with a maximum height of four (4) feet from the ground. 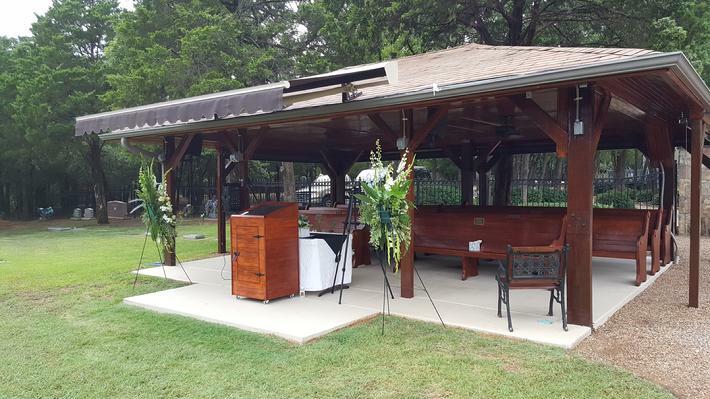 The Pavilion set for a cremation service.